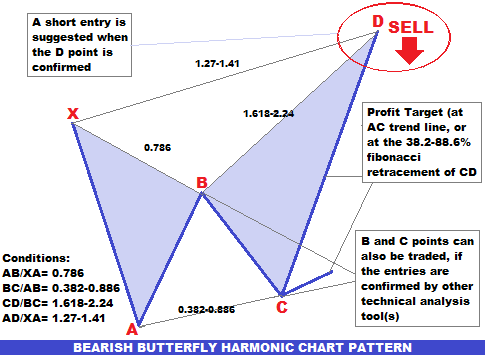 Bearish butterfly harmonic chart pattern suggests a short entry upon completion of the pattern. It is an XABCD harmonic chart pattern. This post is to explain the way to find or draw a bearish butterfly harmonic chart pattern with and without the fibonacci retracement tool, and the way to trade a bearish butterfly harmonic chart pattern. How to draw/find a bearish butterfly harmonic chart pattern on price chart? To draw a bearish butterfly harmonic chart pattern, first of all we need to find the X and A points of the pattern. 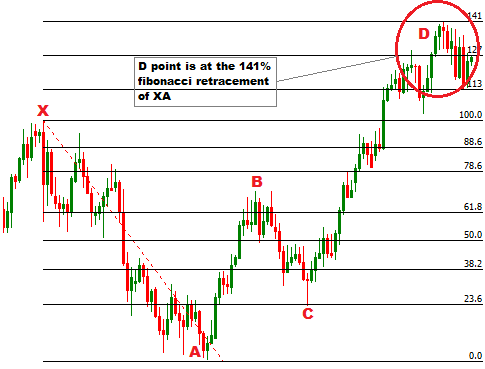 X and A points of the pattern is found at the top and bottom of a bearish trend respectively. In the second step, we will draw a fibonacci retracement tool from X to A to find the B point of the pattern. The B point should be at the 78.6% fibonacci retracement of XA. In the above image, we can see a little failure in confirming the B point of the pattern. B point is confirmed little lower than the 78.6% fibonacci retrcement level of XA, but still we will accept it as the B point of bearish butterfly harmonic chart pattern. We will find so many cases similar to this while analyzing the price chart. In the next step, we are going to find the C point of the pattern. 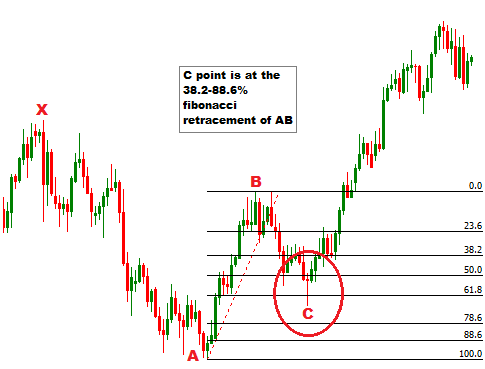 To find the C point of the pattern, we will draw a fibonacci retracement tool from A to B. 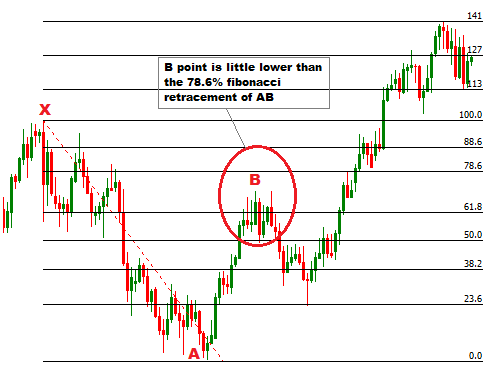 The C point should be between the 38.2% and 88.6% fibonacci retracement of AB. In this step we are going to find the D point of the pattern, to find the D point, we need to draw a fibonacci retracement tool from B to C. The D point should be between the 161.8% and 2.24% fibonacci retracement of BC. Now we need to reconfirm the D point of the pattern. To reconfirm the D point, we will draw a fibonacci retracement tool from X to A. 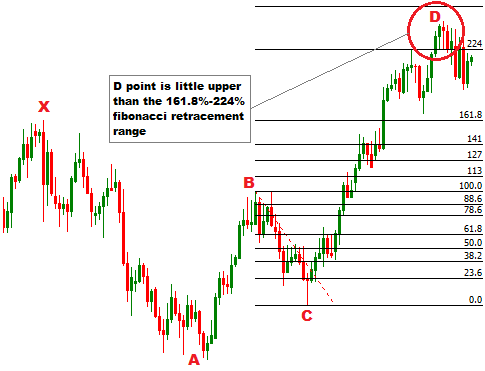 The D point should be between the 127% and 141% fibonacci retracement of XA. In this case we can see, the D point failed to satisfy the CD/BC=1.618-2.24 condition of the pattern, but it accurately satisfied the AD/XA= 1.27-1.41 condition of the pattern.